Whether you’re buying new or just looking to switch your used crawler carriers or drill rigs over to biodegradable oil – Rig Source is knowledgeable and equipped to support your needs. Every crawler carrier and drill rig requires oil for smooth and safe operation, but there are a number of things to consider ensuring you are getting the most out of your equipment. With all the hype and increased regulation surrounding the idea of maintaining environmentally friendly equipment, it’s no surprise that a number of industries are now choosing to use biodegradable oil. Biodegradable oil has gained a highly notable reputation for being less toxic and reducing our dependency on imported petroleum, according to former environmental driller and current drill rig sales representative, Jesse Whittaker. Despite this, there are a few more considerations that the Rig Source team would recommend taking into account before choosing between conventional and biodegradable oil for your new and used crawler carriers or drill rigs. 1) Oil Compatibility – Carefully analyze the characteristic differences between the oil you are currently using compared to what you are considering using. Conventional and biodegradable oils have different characteristics, and often require more cleaning and preparation than just draining the old and filling the new. Poor conversions can lead to break downs, additional wear and tear and even higher operating temperatures. 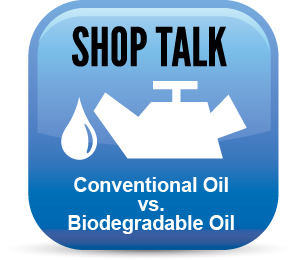 2) Cost – Both conventional and biodegradable oil require maintenance over time. However, depending on your oil selection, certain oils often require additional additives to properly function which could raise the cost of maintenance and overall operation of your crawler carrier or drill rig. 3) Unit Design – Be sure to look at the details of the operating system on your crawler carrier or drill rig. Depending on the type of materials used and overall design, it could affect the way your equipment handles different types of oil. Using the wrong kind of oil will increase the likelihood of increased wear and tear. 4) Equipment’s History – Any good mechanic will tell you that the lubricants and fluids you put into your crawler carrier and drill rigs eventually become a part of the equipment itself. Once a piece of equipment is accustomed to a specific type of oil, changing it has the potential to shock the operating system. Therefore, it’s important to assess the advantages and disadvantages to prevent making any unnecessary changes that could hinder the life of your equipment. If you’ve taken the time to review your oil options, and still have questions regarding which type of oil is right for your crawler carrier or drill rigs – Call Rig Source at 630.365.1649. Our shop team keeps up with the various industry changes and advancements, including those intended to increase environmentally friendliness! *For safety and superior operation, it is highly recommended by Rig Source that you seek professional advice prior to switching oils or using oil that is not listed in your unit’s owner’s manual.